https://matcha-jp.com/en/5853 Reoma Resort In Shikoku - A Dream World With Amusement, Hot Springs And More! Reoma Resort In Shikoku - A Dream World With Amusement, Hot Springs And More! Kagawa's Reoma Resort, an amusement park that includes a hotel and hot springs, is deeply adored by the residents of Japan's Chugoku and Shikoku regions. If you travel to Kagawa with your family, do stop for recreation at this exciting facility! When you think about traveling to the Shikoku, what comes to mind? Most people may think of the islands in the Seto Inland Sea, Ohboke and Kaboute Gorges, or about the famous Buddhist pilgrimage route. Shikoku is a region filled with nature, so it might be strenuous for children and elderly people. This article introduces Reoma Resort, located in Kagawa Prefecture, a facility where people of all ages can have a great time. Reoma Resort, located in Kagawa Prefecture, is the largest amusement resort in the Chugoku and Shikoku Regions, and a well-known sightseeing spot. 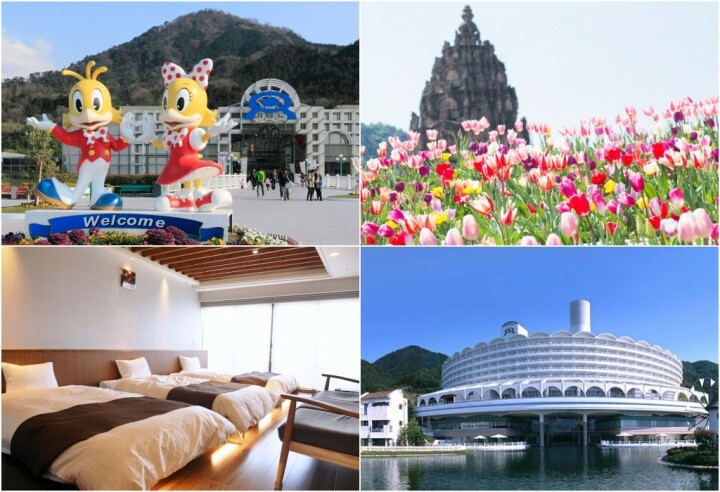 It consists of Hotel Reoma No Mori, Mori No Yu (a natural hot spring), New Reoma World (amusement park), Oriental Trip (a park with displays of re-created Asian architectures) and Reoma Waterland (an outdoor pool open in summer). The site offers both amusement and relaxation to all its visitors. In addition to the rides and attractions, there are also flowers and illuminations in the amusement park section. After a day of recreation, Hotel Reoma No Mori welcomes the visitors with fine food and hot springs. The resort offers both hot springs and lodging services. The guestrooms are spacious and warm, the ideal space to relax. Some of the rooms offer a view of Iinoyama (Mt. Iino), which is also known as the Mount Fuji of the Sanuki (an old name for Kagawa) area. Bathe in the open-air bath, taste fine cuisine, and your weariness will vanish in an instant. For reservations, check this website. New Reoma World is an amusement park for people of all ages. The following are rides and events that everyone can enjoy. ** Please note there are height restrictions for some of the rides. Visitors must first try the Ferris Wheel. It is approximately 50 meters in diameter, and the ride takes about 10 minutes. The Seto Inland Sea can be viewed during the ride, making the Ferris Wheel is a special seat to view the shining sea in daytime, and the illuminations at night. There are two "open-air" gondolas in the Ferris Wheel. Visitors can directly feel the air and the sunshine, and enjoy the view of Seto Inland Sea as well. There are some rides employing the virtual reality (VR) technology, such as an adventure game of riding spaceships and dodging meteorites, or a shooting game staged in a city from the near future. These rides are for those who want to experience something out of the ordinary. If you feel that VR rides may be too stressful, try the pleasure cruise. Board the ship, and watch the Greek-style architecture on the banks, or its reflection on the canal. The passengers will be able to relax, feeling the faint breeze. A projection mapping show at Legend Palace, an event to enjoy a fantastic light performance. At Reoma New World, be sure to take a close look at the park design. In the Oriental Trip section, there is an elaborate re-creation of the Cambodian Angkor Empire architecture, along with cultural exhibits from Bhutan. At night, there will be a projection mapping performance at Legend Palace, creating a 360-degrees, three-dimensional world. Mt. Iino, which is also known as Sanuki Fuji, can also be viewed from the Oriental Trip section. New Reoma World hosts various events every season. The outdoor pool, a facility which is open only in summer, is the largest of its kind in the Shikoku Region. The mountain range can be viewed around the pool, and the clear, blue sky enhances the feeling of freedom and spaciousness. In winter, the capybara hot spring opens, creating an adorable scene. A family of three capybaras reside at New Reoma World, bathing in this pool from spring to autumn, and enjoying the hot springs in winter. The cuddly animals are very popular to the visitors. Reoma Flower World section is another must-see spot for the visitors. About 100 types, 420 thousand flowers in all, are planted in an area of approximately a million square meters. Cosmos, moss pink, Japanese hydrangeas and tulips welcome the visitors all year round. Reoma Resort offers special optional tours for the hotel guests who wish to enjoy Kagawa Prefecture and taste the famous Sanuki udon (noodles). The tour starts from the hotel, and the participants can visit the sightseeing spots, taste fine food, and return to the hotel. The details vary depending on the season, so guests who want to enjoy the best of Kagawa should join this tour. Please note that this tour is available only to the guests staying at Hotel Reoma No Mori. Reoma Resort is a sightseeing spot for people of all ages, complete with an amusement park, hotel and hot springs. As it is located near a vast mountain range, visitors can feel nature within an urban amusement park. A free shuttle bus runs from Okada Station of the Kotohira Electric Railroad, so the resort can be accessed easily. Reoma Resort is also connected by local bus to Takamatsu Airport. If you're planning a family trip, this is the place to visit. For MATCHA readers, this article also serves as a special discount coupon at Hotel Reoma No Mori. When checking in at the hotel, show this page to the staff. A 2000 yen discount per room, applied when the guests check in. * The offer expires on February 28th, 2019. * At the time of reservation, please notify the hotel that you have read this MATCHA article. * This coupon can be used only by guests settling their accounts at the hotel, either by cash or credit card. * The coupon can be presented using a smartphone at check-in. * This coupon cannot be used with other coupons or discount services and will be applied only on private trips. ** Business hours may change according to the seasons. Please check the website for details. Takamatsu Travel Guide: Access, One-Day Trips, Souvenirs, And More!